Russian Soyuz spacecraft carrying NASA Astronaut Nick Hague and Christina Koch, and Cosmonaut Alexey Ovchinin successfully docked at the International Space Station. Russian Crew members are called as Cosmonauts. 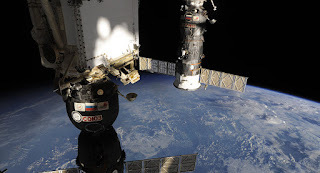 Soyuz is a Russian Spacecraft that carries people and supplies to and from the International Space Station. Soyuz Spacecrafts also function as lifeboats and one Soyuz spacecraft is always docked to the space station, so that in case of emergency the crew can return to earth through the spacecraft. After the retirement of the space shuttle in 2011, the Soyuz spacecraft has become the sole means of transportation for crew members going to or returning from the orbiting laboratory. The ISS maintains an orbit with an altitude of between 330 and 435 km (205 and 270 miles) by means of re-boost manoeuvres and circles the Earth in roughly 92 minutes and completes 15.5 orbits per day. The ISS programme is a joint project between five participating space agencies: NASA (United States), Roscosmos (Russia), JAXA (Japan), ESA (Europe) and CSA (Canada). Q. Which Russian spacecraft carrying NASA Astronaut Nick Hague and Christina Koch, and Cosmonaut Alexey Ovchinin successfully docked at the International Space Station?